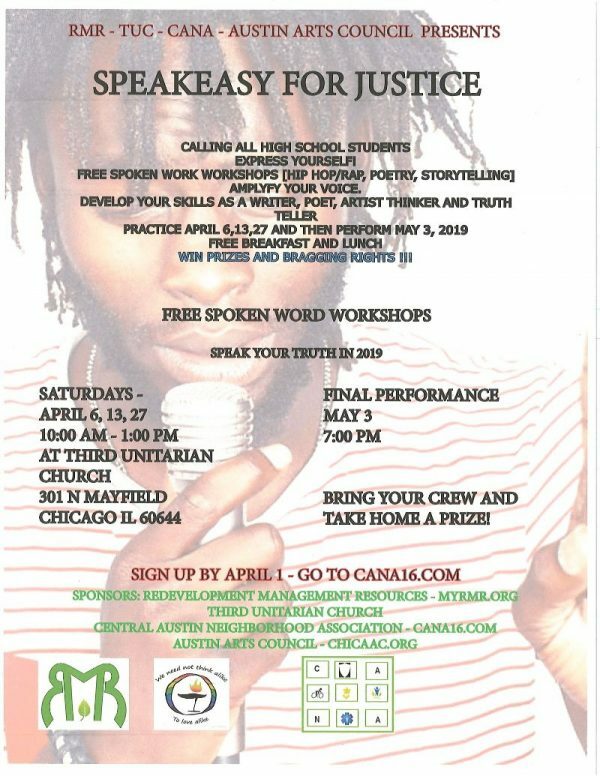 West Side teens are invited to participate in a “speakeasy for justice,” which will be held 10 a.m. to 1 p.m. on April 6, 13 and 27, with a performance set for 7 p.m. May 3. I Am We’s pilot program C.A.K.E (Communication, Accountability, Knowledge and Effectiveness) aims to promote leadership, deter violence and create unity among teen girls through storytelling. 7th and 8th graders from Ella Flagg Young and Duke Ellington Elementary schools who participated in the 21st Century’s Beyond the Bell summer program performed Friday. The Afrikan Village & Cultural Center of Chicago will host Momma Kemba from 3 to 5 p.m.
Chicago West Community Music Center and 2nd Story present “Breaking Through” May 31 and June 7. The group made a stop at Austin Town Hall Sept. 22 to hear stories from residents and guests for their upcoming storytelling and musical interpretation series.